More than 160 Duncanville High School students are returning to school a day after a dress code crackdown sparked outrage with students and parents. Students who spoke with NBC 5's Ellen Bryan before school Thursday said some of them would continue to be in violation of the dress code to protest the administration's policies. Duncanville administrators said violations include: Piercings, large belt buckles, untucked shirts, different colored jackets and other issues. Click here to read the Duncanville ISD dress code. Conduct crackdowns take place a few times a year and have targeted class tardiness, among other issues. Student who are protesting the dress code said they will continue to show up in violation of the rules for the rest of the school year -- no matter how many suspensions they are given. The protestors are now making a movement to try to get the dress code repealed, using a Change.org petition with over 200 signatures thus far, and using the hashtag #DuncanvilleProject on Twitter and Instagram to share support on social media. As students returned to school Thursday, school administrators said while they did turn some students away for violating the dress code, the school day has been "normal" and orderly. Administrators refused NBC 5 requests for interviews on Thursday because they say there was nothing different today from the policies they said they've enforced all year. "This is what my student got suspended for," said Angela Salerno. "He just didn't shave for one day and this hair stubble is what his suspension letter said. That's ridiculous." Salerno's son, who is a junior at Duncanville High School, is just one of more than 160 students who were suspended because of dress code violations. Word quickly spread of the suspensions, triggering chaos in the hallways among the students. Video shot on mobile phones showed students running through hallways. Another video showed a student throwing a trash can into the middle of a crowded hallway. Posts on social media services like Twitter and Instagram described a "food fight" at the school. Duncanville police were called to the school to help get things in order, but no arrests were made. Students who were able to get back into dress code were allowed back in class. But many of the students could be found anywhere but the classroom Wednesday, like Shania Hornsby. "I didn't have a problem with taking out my nose ring, that's not the problem," said Hornsby, who is a senior at Duncanville. "The problem is why you didn't enforce this all school year?" 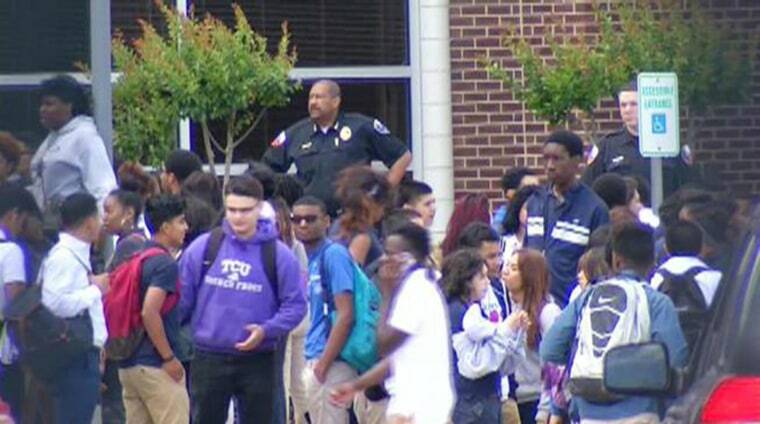 "As far as a warning, we have been enforcing it all year long," said Dr. Andre Smith, who is the principal at Duncanville High School. But many students said they were never warned about dress code violations this school year. "All year and you're going to wait three weeks until they get out of school to suspend hundreds of students — makes no sense," said Salerno. The principal told NBC 5 students are held to high expectations. "I think it's part of our responsibility to help students adhere and reach those expectations in school and outside of school," said Smith.